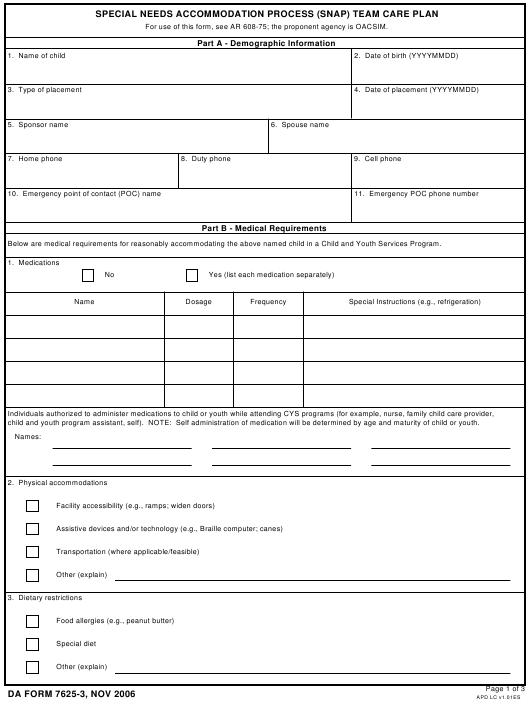 DA Form 7625-3 - also known as the "Special Needs Accommodation Process (snap) Team Care Plan" - is a United States Military form issued by the Department of the Army. The form - often mistakenly referred to as the DD form 7625-3 - was last revised on November 1, 2006. Download an up-to-date fillable PDF version of the DA 7625-3 down below or look it up on the Army Publishing Directorate website. Below are medical requirements for reasonably accommodating the above named child in a Child and Youth Services Program. child and youth program assistant, self). NOTE: Self administration of medication will be determined by age and maturity of child or youth. 504 plan that impact on child care setting.